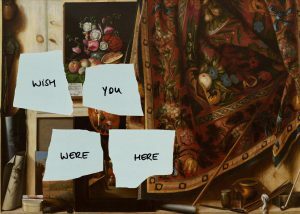 In WISH YOU WERE HERE, three painters take down their studio walls and invite audiences to step inside these mysterious spaces and become creative collaborators. Sarah Arriagada, Silvia von Pock and Maria Schoof have each set up a version of their studio inside the gallery and will be in residence throughout, working with visitors to co-produce new artworks. The exhibition will evolve as visitors generate new work, to be celebrated at a closing night event. The artist’s studio can be a retreat, a private paradise, a solitary even a lonely place where the magic of making work unfolds. This exhibition highlights the distinct, complex and changing relationship each artist has with their studio. Von Pock describes, “escaping into a private wilderness where inner and outer worlds connect for a timeless while”. She provides a shamanistic tent made from rubber bands and filled with art materials where visitors can work in a sheltered atmosphere. As the mother of a small child, Arriagada recently found herself making work, “at home, in the night and developing ideas increasingly in her head rather than while handling materials”. Craving companionship and the togetherness that comes with sharing ideas, Arriagada invites visitors to add their marks to her designs for hand-knotted rugs. These will be reworked and made into rugs for a future exhibition, creating a sociable space where the artist’s domestic and creative lives are united. Schoof adapts two small rooms to involve visitors in the meditative process that precedes the act of painting. The first room is a place for quiet introspection where visitors can connect with their “inner space of remembrance or spiritual connection”. The second room, filled with powerful personal objects, photographs, figures and dreams lays out Schoof’s individual mythology, the ‘personal cosmos’ she draws on when making paintings. Like a postcard from a faraway place, WISH YOU WERE HERE is an invitation to join these artists in their creative spaces where their working processes are revealed, demystified and shared. For further information, images or interviews please contact Sarah Arriagada, contact@saraharriagada.com or Christine Preuschl, raumlinksrechts@das-gaengeviertel.info. For the Facebook event listing, please click here. For the German press release, please click here. Raum Linksrechts is open Thursday to Saturday, 5 – 8 pm. 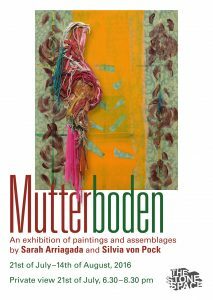 Mutterboden brings together German painters Sarah Arriagada and Silvia von Pock and their shared interest in a playful, material and process-based approach to image making. Both artists take everyday household materials as their starting point, from cheerful textiles to discarded packaging and plastics, and create paintings that explore their visual, tactile and structural possibilities. The German word Mutterboden (mother soil: engl. top soil) refers to the earth, the medium in which things germinate and flourish. In the context of this show it alludes to the mass of ‘stuff’, the visually fertile layers of cheap, colourful debris that surround us and from which these art works grow. Both artists have a love of textures and an openness to haptic discoveries that are allowed to shape their work, sometimes taking them outside the framework of canvas and stretcher and beyond the flat plane. But Arriagada and von Pock’s contrasting strategies produce paintings that throw each other into sharp relief. Substituting domestic textiles for canvas, Arriagada continually layers and strips back paint, sometimes reversing the stretcher as she seeks a purified, distilled, image in the face of colourful excess. Von Pock’s impulse is to collage and encrust, building layers and massing materials until new visual effects are found in works that are structurally self-supporting. Shown together for the first time at The Stone Space, Arriagada and von Pock’s works generate a lively dialogue with and about seemingly worthless materials and what they offer the restless and resourceful eye. For further information, images or interviews please contact Sarah Arriagada, contact@saraharriagada.com. For the Facebook event listing, click here. Silvia von Pock revels in the wealth of cheap, disposable materials that surround us, using them to make multi-media paintings that reveal the visual power of everyday detritus. Her work is driven by a playful responsiveness to the colour and structural possibilities of found plastics, discarded packaging and pound shop treasures, which she shapes into works that take painting beyond the flat plane. Broken rubber bands, throbbing with synthetic pigment, are stitched into luxuriant fringes, woven through mesh or bunched and swagged to form a tangled air orchid. Plastic drinking straws are glued into self-supporting structures, collaged to build rippled layers of colour or bristle from painted surfaces like coral formations. Von Pock masses these materials in large quantities until she finds a tipping point where a new quality or effect emerges. The natural and the artificial collide in works where oddly organic appearances grow from accumulations of synthetic materials. Latex puddles form congealed rock pools, marshmallows float in gungy slicks of paint, and garishly coloured modelling clay oozes brightly coloured growths like toxic confectionery. Whilst von Pock describes herself as a critical consumer, her work communicates a restless excitement at the inexhaustible visual possibilities of household rubbish and throwaway tat. Alive with surprising textures and discoveries, these works continually resist our perceptions of debased ‘stuff’. 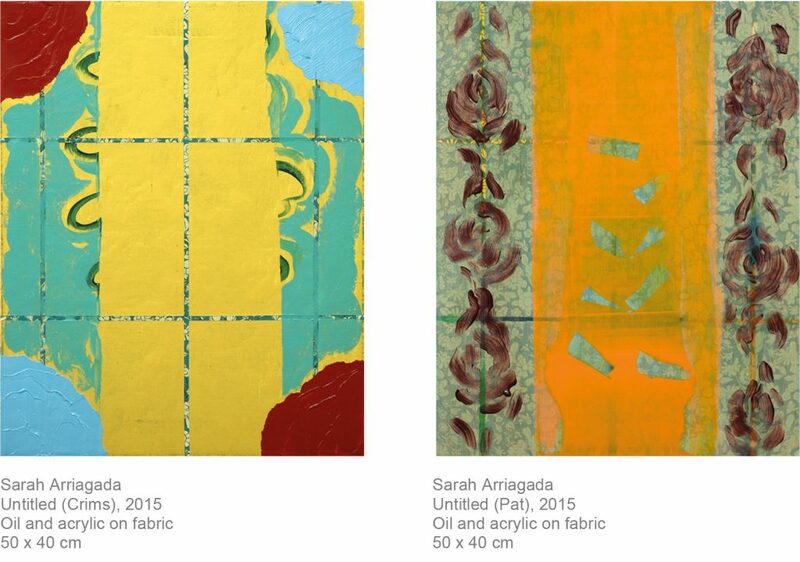 Sarah Arriagada’s works exude a light, playful quality and a joyful sense of the power that painting has to hold conflicting impulses in a momentary state of balance. Drawing on her interest in the fetishization of domestic interiors, Arriagada combines cheap textiles with both process and gestural painting techniques to produce works that explore the boundaries between fine art and decoration, ‘taste’ and kitsch, the precious and the banal. Taking the everyday as her starting point Arriagada paints directly onto unprimed canvas or flimsy fabrics such as gingham, allowing elements of chance to shape the continual reworking of each canvas until she arrives at a point of visual clarity. In an almost ritualised process, she repeatedly applies and scrapes back layers of oil and acrylic to establish a grid or patterned ground against which organic shapes flourish in naïve, expressive strokes. Arriagada’s actions seem both tentative and bold, awkward and assured as she reverses a canvas and reworks it in chalks and pastels, stencils through lace or blocks out and then exposes the tacky floral print onto which thick colour fields have been applied. The resulting paintings with their fluid, dynamic surfaces invite active looking and open up intimate and elusive spaces, rich in colour, texture and nostalgic association.